Baby borders for the nursery walls are no different than any other wallpaper border. Sure, there are motifs and pictures of items that would be of interest to infants and that tickle their parents pink, but beyond that you might say that one wallpaper border is pretty much the same as any other. You will approach choosing baby borders the same way as you pick paper and paint colors for any other bedroom. Carry the baby accessory that you want to match down to the home improvement store, pick the best colors, paste or paint your decorations on the nursery walls and the job is done. 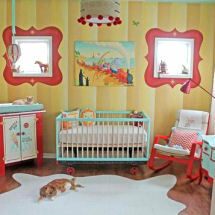 You may ask whether traditional pre-pasted baby wallpaper borders are better than stenciled or painted baby borders. Time and the desire for creative control should be the basis for the decision on whether to paint or stencil your nursery border or to buy a few rolls of vinyl border and hang it on the nursery wall. Hanging a few rolls of cute baby wallpaper border will probably take less time than stenciling, but may be more expensive. Stenciling will take more time, but might cost less than baby borders that you buy. You might be lucky enough to find suitable baby borders in the closeout bin at substantial discounts. Before you rejoice over finding this inexpensive prize, make accurate measurements and know exactly how many yards of border that you will need to complete your project. It would be extremely disappointing to run short of material and be unable to buy more rolls because the pattern has been discontinued. Stenciling baby borders in your nursery can be fun and may also be the very best way to get a good color match to your baby’s bedding set, nursery theme and accessories. There are lots of baby stencils that you can use. I would also like to make the suggestion that you explore the possibility of making your own baby stencil designs. Some cute ideas for making your own unique baby borders would be to make stencils from your baby’s hand and footprints and make a personalized border pattern. You can stamp the design at chair rail height around the room in whatever color is best for your baby’s bedroom. Pink or blue are popular colors to use in the nursery, but pretty much any color works for today’s modern nursery walls. Return to Unique Baby Gear Ideas to see the latest decorating ideas using wallpaper borders for the nursery.